Located in Cala Ratjada, Sensity Chillout Hotel Cala Ratjada is by the sea and convenient to Cala Ratjada Port and Cala Agulla Beach. 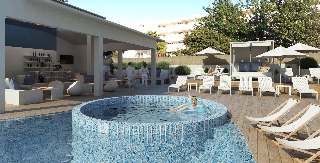 This 4-star resort is within the vicinity of Cala Gat Beach and Canyamel Golf. Make yourself at home in one of the 119 guestrooms featuring minibars and flat-screen televisions. Complimentary wireless Internet access keeps you connected, and satellite programming is available for your entertainment. Private bathrooms with showers feature complimentary toiletries and hair dryers. Conveniences include phones, as well as desks and blackout drapes/curtains. Spa, Premium Amenities Enjoy a range of recreational amenities, including an indoor pool, a sauna, and a fitness center. This resort also features complimentary wireless Internet access, an arcade/game room, and a television in the lobby. All-inclusive rates are available at this resort. Meals and beverages at onsite dining establishments are included in all-inclusive rates.